Believe it or not, a homeowner can often solve the mystery of a malfunctioning outlet before calling in a pro. Keep reading to know which solutions are DIY-able and which could use a call to an electrician. 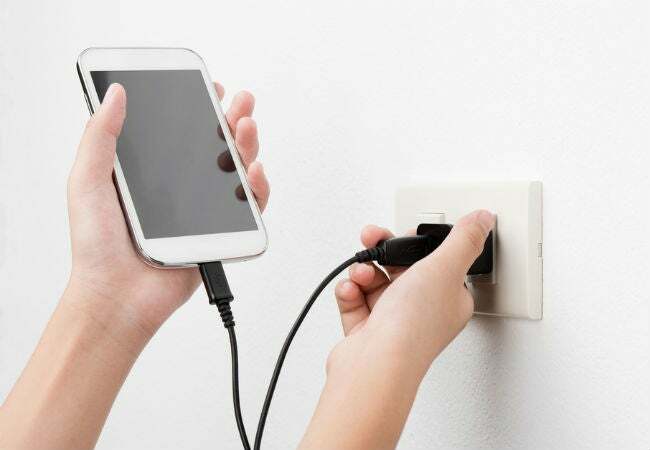 Q: When I plugged my cell phone charger into a kitchen outlet, my phone didn’t start charging as it normally does—rather, it seemed that this one electrical outlet was not working. I could charge it elsewhere, of course, but we have very few outlets in that space already. Is there something I can do to fix the outlet myself? Or, should I call an electrician? A: While there is a chance that you’ll have to bring in an electrician, in many cases, the problem behind a non-working outlet can be easily resolved by the homeowner. We’ll help you troubleshoot the issue by walking through the most common causes and solutions, starting with the ones you can remedy yourself. First, a quick note on outlets: The vertical slots in the outlet are called “shutters,” and the small hole beneath each set of shutters is the “ground.” Most outlets will accept either 2-prong or 3-prong plugs. If your home has older wiring, the third hole (the “ground”) may not be present. Keep this anatomy in mind as you try the following troubleshooting tips. Flip a light switch in the room to determine whether you have a half-hot outlet. Sometimes called a “lamp outlet,” this type of outlet is a little different from standard outlets in that half of it (usually the bottom half) is controlled by a switch on the wall. The purpose of a half-hot outlet is to allow you to plug in a lamp, turn it on, and then control the lamp from the light switch. If you’ve noticed a switch on the wall that didn’t seem to go to anything, it could very well control a half-hot outlet—flip this switch and then try the outlet again. Plug something different into the outlet. On the off-chance that it’s not the electrical outlet but rather your cell phone charger that’s not working, plug something else into the same outlet, such as a hairdryer or a lamp. If it’s a GFCI outlet, it might have shut off automatically and need to be reset. Building codes require the installation of ground fault circuit interrupters (GFCIs) in bathrooms, kitchens, and laundry rooms—anywhere near water. As you (hopefully) already know, water and electricity don’t mix. Before the advent of GFCIs, electric shock injuries were more likely to occur if someone was standing in water, sitting in a tub, or otherwise in contact with water and they were using an electrical appliance, such as a hairdryer. The electrical current could surge through the person, electrocuting them. 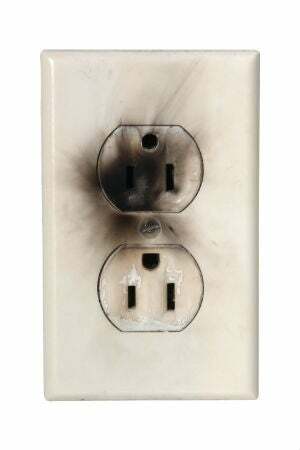 When a GFCI outlet senses a surge in electricity, it’s designed to shut off to minimize the risk of electrocution. Unfortunately, GFCIs can be temperamental and shut off occasionally, even when a surge has not occurred. But it’s an easy fix: Just push the small rectangular button on the center of the outlet and it will reset the GFCI. Then, pug in your charger and see if it comes on. Test other outlets to see if they are working. If you lose power to an outlet, the majority of the time, other outlets nearby will also lose power. Plug your charger into other outlets in the room to see if they’re working. If other outlets are dead, the problem could be at the breaker panel, which we’ll inspect next. Check your home’s breaker panel to see if any breakers have flipped. The breaker panel, often located in a utility room or basement, features multiple breakers (switches), and each one controls the power to a different part of your home. Open the panel door and you’ll see one or two rows of switches labeled “OFF” on one side and “ON” on the other side. If a breaker flipped, the switch will be in the middle, between OFF and ON. If you find one in the middle, flip it to the OFF side first, and then flip it to the ON side. That will reset the breaker. Go back to the problem outlet and test it again. Unplug something to keep from overloading the electrical circuit. If the power was restored to the outlet after you flipped the breaker, you might have overloaded the circuit. An overloaded circuit (each switch in the breaker panel controls a separate circuit) can happen if you plug too many things (especially heat-generating appliances) into the same circuit. When that happens, the circuit breaker will flip because you’re attempting to draw more electricity than the circuit can handle. If the breaker flipped but you haven’t overloaded the circuit, the problem could be a short circuit. A short circuit occurs when the intended flow of electricity is interrupted, such as when are wires are accidentally in contact. A short circuit is dangerous and can lead to a fire. If the breaker flips again after you’ve reset it—and you don’t have anything plugged in—leave the breaker off and call an electrician. Loose connecting wires can cause an outlet to lose power. If you’ve gone through the previous troubleshooting steps but you still don’t have power to the outlet, there’s a chance it’s due to loose wires. If you’re not comfortable checking outlet wiring, this is the time to call the electrician. If you’d like to check the wiring yourself, it’s not too difficult. First, make sure the breaker to the outlet is switched to the OFF position. Then, using a screwdriver, remove the faceplate from the outlet and remove the screws that hold the outlet in place. This will allow you to pull the outlet a few inches out from the outlet box. Check to make sure the ends of the wires that attach to the outlet are securely fastened beneath the outlet screws. The black wire attaches to the gold screw on the side of the outlet, and the white wire connects to the silver screw on the other side. A copper or green wire attaches to the bottom of the outlet. If any of the wires have come loose, reattach them by positioning the wire beneath the corresponding screw and then tighten the screw securely to hold it in place. The outlet, itself, could be faulty. Although it isn’t common, an outlet can burn out or otherwise go bad and quit functioning. If you’ve followed the previous steps without success, you might want to consider replacing the outlet. Once again, if you intend to do it yourself, make sure the breaker switch that powers the outlet is in the OFF position. Then, remove the outlet cover and the disconnect the wires from the old outlet with a screwdriver. Reverse the process to install the new outlet, making sure the wires are connected as described in the previous step. If you still have no power at the outlet, it’s time to call an electrician. Home wiring is a complex system, and electricians have special equipment and testers to help them locate electrical problems that are difficult to pinpoint otherwise. If the problem was not remedied by the previous steps, it’s a good idea to have an electrician take a look.